The OMEGA™ PV100 Series comprises economical proportional valves for use with gases. 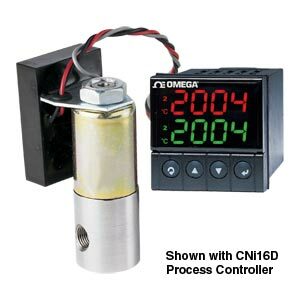 They combine a solenoid valve with an electronics package that digitally modulates the control signal to provide analog proportional control without the expense or complexity of stepper motors, servo valves, or other proportioning devices. The PV100 Series can be used in open- or closed-loop systems to control flow, pressure, temperature, speed, or position parameters of gases.